That Atlanta is one of the capitals of the New South is both (a) beyond dispute and (b) not exactly right. It is one of the largest cities in the South and the ninth largest metropolitan area in the country. It is a commercial, industrial, media and cultural center for the entire region. Atlanta’seconomy ranks 15th among world cities and sixth in the nation. It is a profoundly cosmopolitan city that is, in many ways, entirely in step with the great capitals of the world: an alpha city. And yet Atlanta is, in some ways, out of step with much of the South. It is in the South but it is not entirely of it. During the height of the civil rights struggles of the 1960s, the city’s civic leaders tried – not always successfully – to portray Atlanta as the “city too busy to hate.” The very things that have made Atlanta such a cosmopolitan center – the influx of immigrants, national and international – has diluted its strictly Southern character. Thus, while Southern culture is an inherent part of Atlanta’s character it is only one part of the cultural fabric of a truly international city. This phenomenon is reflected in Atlanta’s cuisine. From the ethnic restaurants of Buford Highway to the chef-driven dining scene of Hugh Acheson and Kevin Rathbun’s restaurants (amongst many others) there are both classically Southern and international influences on Atlanta’s culinary landscape. These diverse influences, combined with the natural bounty coming from the region’s farms and a long growing season rivaling California’s, have combined to make Atlanta one of the most exciting culinary scenes in the country. 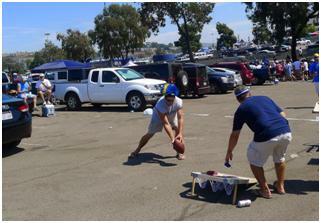 With the Atlanta Falcons coming to San Diego’s Qualcomm Stadium to play the Chargers we wanted our tailgate to reflect both Atlanta’s Southern traditions and its cosmopolitan character. Shrimp and Grits is, without a doubt, one of the signature dishes in Southern Cuisine and one that has already made an appearance in this space (http://sdfoodtravel.com/low-country-cuisine-shrimp-and-grits/). Grits, itself, is a kissing cousin to Italian polenta – the key difference being that grits is made from corn with a starch known as “dent” whereas polenta is made from corn featuring a starch known as “flint.” Another difference is that grits are usually eaten as a soft porridge. 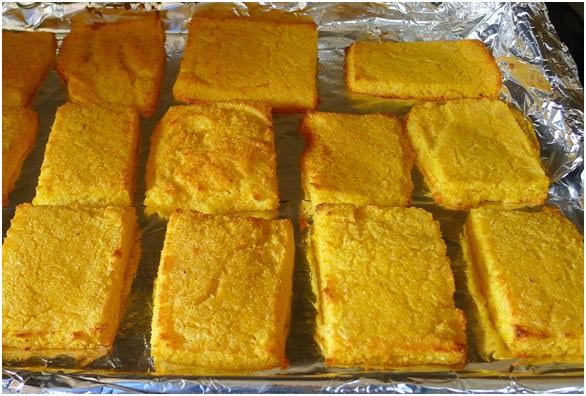 Italians often take the polenta porridge and bake or grill it into a solid “cake” form. 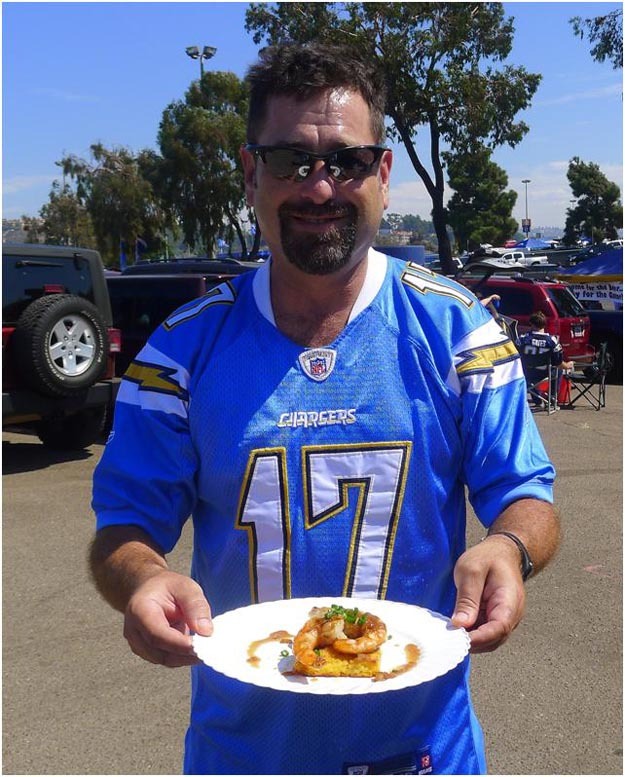 And so our tailgate dish was born: treat the grits as the Italians treat polenta, baking it into cakes, and build a shrimp and grits out of that. We paired it with our version of red eye gravy. This Southern classic is a thin sauce that is traditionally made from the drippings of pan-fried country ham, bacon, or other pork, typically mixed with black coffee. Cook the Grits. In a large saucepan over high heat add the chicken stock, bring to a boil and slowly whisk in the grits. Turn the heat to medium-low and cook, stirring occasionally, for 30 to 40 minutes (depending on the cut of the grits). When done, add the cheese and stir until it is melted. Season with salt and pepper and set aside. Use a gentle touch with the salt because the GranaPadano cheese is salty. Line a sheet pan with parchment paper. Pour the grits onto the lined sheet pan and refrigerate for at least two hours (overnight is even better). Bake the Grits Cakes. Preheat the oven to 325° Fahrenheit. Remove the sheet pan from the refrigerator and cut out 16 cakes (either by hand or using a biscuit or cookie cutter). Bake the cakes for ten minutes or until they are just browned around the edges. Marinate the Shrimp. At least half an hour before cooking the shrimp, combine all of the shrimp ingredients (except the shrimp) in a bowl and whisk to combine. Pour the marinade over the shrimp and marinate in the refrigerator for at least half an hour. Grill the Shrimp. 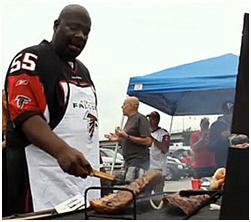 Heat a grill or a grill pan (or, in an emergency such as we experienced at the tailgate, both) until quit hot. 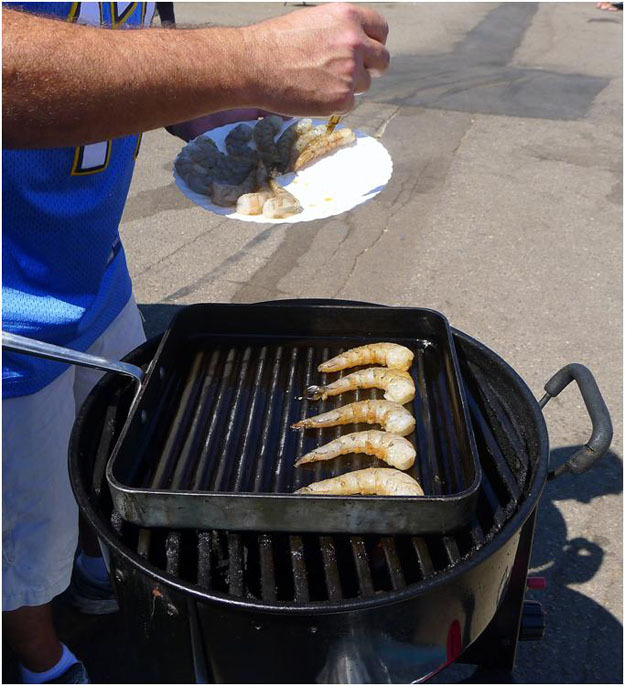 Place the shrimp on the grill and cook for two to three minutes, until they are marked. Flip the shrimp and cook for two to three minutes more, until they are marked and pink. Plate the Dish. 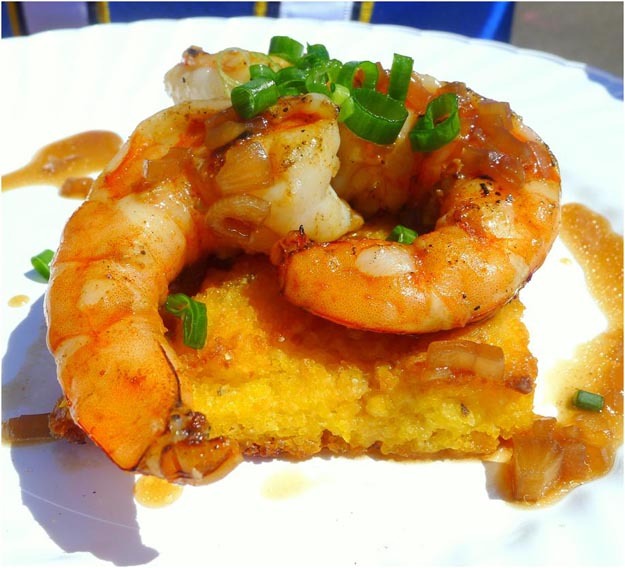 Serve two to three shrimp over each grits cake. Drizzle with the sauce, garnish with the scallions and serve. Thank you so much for this recipe. Ive been looking for a shrimp recipes since its one of the hardest to prepare, plus its coarsely ground hulled grain. The plating presentation is hilarious and what catches my attention were the men behind the cooking very tricky and masculine.